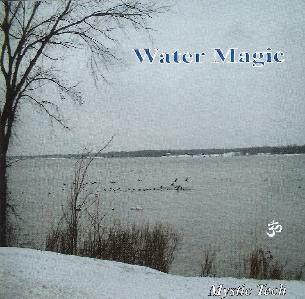 Mystic Tech - "Water Magic"
If a genre had to be given to describe Water Magic, I would have to place it in the New Age/Meditation/Relaxation category, because that is exactly what it is. As the title suggests, as also do the track titles, I seem to get an inkling that water is perhaps a main feature here. With titles such as 'submerged,' 'crashing surf' and 'raging stream,' I immediately imagine one of those New Age relaxation natured CD's of a whale uttering their oscillated frequencies, or birds tweeting concern for Humankinds disregard for them, wind, rain, or indeed water. I find that I am right, but I am also wrong. Right because this has the rushing stream loops, whales, and birds. Wrong because it takes you somewhere that those CD's never do. So therefore I can say that this CD is not one of those tacky CD's that you can buy in most petrol/gas stations the length and breadth of the globe. It is not just compiled by loops of the same shite, and I find that it is in fact a constructed and played creation, which is definitely not the same from start to finish. Also, using water as the initial theme, it moves on a journey, and yes, I repeat, it does have running water, whales, and all the other stuff theses meditation CD's seem to require. This however does not make it bad, but rather interesting. Mystic Tech, by the way, is one fellow by the name of Richard Wixner. He is a sonic meditation experimenter from New York, and his releases are many. The CD's, however, are focused on a meditation aspect, using sound to induce peace, so to speak. So, with this in mind, I will approach the review in these aspects, and try to compile a relative description of the sound for you. To begin with, the use of sequences, chord structures, and common tinkling throughout seems to take it outside the norm of the genre. This is because of the way that it moves and progresses, and also by the way that it does not always sound pretty, meaning sometimes it is a bit hard to keep that meditation focused, if you know what I mean? The mind tends to wander away towards the kitchen or something! However, Water Magic does indeed span its 71 minutes with a very ambient feel. It is based solidly in the electronic world. The sounds used are soft in places, harsh in others, and it could be likened at times to Tangerine Dream, and others to Tomita. The production is good, even though personally I feel that the water samples are at times too in the forefront, subsequently making the synthy tinkling in the background seem slightly lost. This however is my only fault. I would advise headphones in a darkened room with a couple of jazz woodbines, late of an evening, to sink into it properly.